The boss of Italian retailer Conad has criticised government fiscal policy, saying a likely increase in VAT will hit families and is not enough to contain public spending. Italy's VAT rate is set to rise on 1 July under an agreement struck earlier this year by then Prime Minister Mario Monti and the EU. Members of the current coalition have put pressure on Premier Enrico Letta to try to stop the VAT hike, although with the end of June approaching, a reversal of the plan appears unlikely. Conad general manager Francesco Pugliese said the "more than likely" increase in VAT would hit consumption. Speaking on Wednesday (19 June) after Conad reported an increase in sales in 2012, Pugliese also rounded on the government's fiscal strategy. "Despite a very difficult year, Conad closes the year with positive results, made possible by the commitment of our members," Pugliese said. "Worryingly, however, the more-than-likely increase in VAT will heavily penalise Italian families. We consider unacceptable the idea that you can think of containing public spending simply by raising taxes and raising another percentage point of VAT. The revival of the economy and consumption requires, first of all, to make public spending more rational and efficient. At EUR800bn, it is worth 50% of the national GDP and diverts resources from private economic activity." 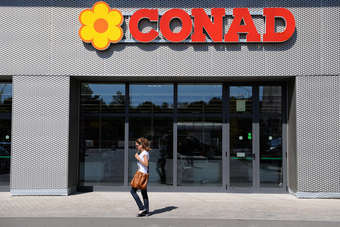 Conad saw turnover increase 7.3% in 2012 to EUR10.91bn (US$14.43bn). Citing data from Nielsen, it said its market share rose by 0.7 percentage points to 11.3%. The retailer, which last year set out plans to spend EUR770m between 2012 and 2014 on expansion, said it would invest EUR240m this year. Some 2,200 new jobs would be created, it said.